Whether you’ve got a top-of-the-line dishwasher or have to scrub everything by hand, there’s always room to improve your dishwashing game. Because you’ve got better things to do than spend your time chiseling away at that caked-on lasagna. 1. DO THEM RIGHT AFTER YOU EAT. After cooking and eating a meal, dishes are probably the last thing you feel like doing. But all those stains and that stuck-on food will be easier to scrape away while they’re still fresh. Get it done and save yourself the trouble before bedtime. 2. DON’T PRE-SOAK IF YOU USE A DISHWASHER. Some people don’t trust their dishwasher to clean away crusted-on food. But according to experts—including an engineer interviewed by Woman’s Day—detergents today are formulated to attack food particles, and can actually wear down dishware that goes into the wash too clean. You’ll want to scrape off large food chunks first, of course, but after that, go ahead and stack it. 3. USE A PLASTIC BIN. To pre-soak those pots, pans, and other dishes that need hand washing, fill up a plastic bin with lightly soapy water, and drop them in. This will keep the rest of the sink free, especially if you keep the bin on the counter. And, it’ll prevent those precarious stack jobs that can take over a sink. 4. USE COLD WATER ON DAIRY AND STARCHES. Hot water can turn these two ingredients into sticky messes. If you’re washing by hand, you’ll want to use cold water to clean away dairy and starchy foods (so, this would be a must after you feast on cheesy mashed potatoes). 5. CLEAN POTS AND PANS WHILE YOU COOK. To stay ahead of the game, use any downtime during cooking— i.e., while the pasta’s boiling—to wash some dishes. Master this part of the game, and you’ll only have the serving ware to deal with after each meal. 6. IF YOU’RE HANDWASHING, GO FROM LARGEST TO SMALLEST. To save yourself from constantly rearranging dishes on the drying rack, clean and stack the largest pots and pans first, then work the smaller dishes in around them. 7. AN OVEN RACK IS GREAT FOR DRYING. If you’ve run out of space on your drying rack, simply rig up another one using an oven rack. The grates allow air in and water to drain away, and many have turned-down ends that will keep dishes elevated. Just don’t forget to slide a dishtowel underneath. 8. SECURE STEMWARE INSIDE THE DISHWASHER. There’s nothing worse than opening the dishwasher to find a broken wine glass or two. To keep fragile stemware from jostling around, secure them to the tines using a rubber band or twist tie. 9. USE A LAUNDRY BAG TO HOLD SMALL UTENSILS. This tip, courtesy of Real Simple, lets you run bottle caps, measuring cups, and other small items through the dishwasher without having them fall through the grates. Place everything inside a laundry bag, and slide it onto the top rack. 10. USE THE SPACE ABOVE THE SINK. Because water never stays in the sink where it belongs, make sure to keep paper towels and dish towels high and dry. Hanging hooks and dowels are easy to rig up, and if you’re even slightly handy, you could hang a drying rack over the sink. 11. PUT OTHERS TO WORK. Washing dishes is a burden no one should have to bear alone. Kindly ask your spouse/friends/houseguests/visiting dignitaries to scrape their plates and stack them on the counter, in the sink, or in the dishwasher. 12. BOIL WATER AND SALT TO GET RID OF BURN MARKS. Save yourself loads of scrubbing and follow this tip from lifestyle queen Martha Stewart. Fill the offending pot or pan with cold water and 2 to 3 tablespoons of salt, and then let it sit overnight. Next day, bring the water to a boil, drain and wash with soap. 13. THERE’S A RIGHT WAY TO LOAD THE DISHWASHER. A dishwasher is an amazing invention, but it won’t magically clean plates that are sandwiched together. 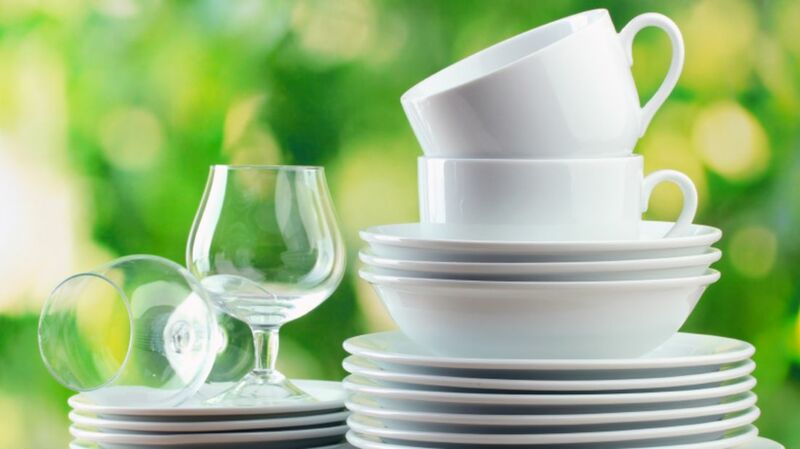 Stack dishes so that they’re properly spaced and facing the center of the unit, where the spray valve is located. Also: Place cups around the tines, not on them; and make sure spoons and other utensils are arranged so they don’t nest. 14. CLEAN THE GARBAGE DISPOSAL WITH LEMON AND VINEGAR CUBES. It’s easy to neglect the whirring, grinding appliance that toils away beneath your sink—that is, until you start to notice a foul odor emanating from the depths. To keep your garbage disposal clean and odor-free, throw in a few lemon and vinegar ice cubes. Just fill ice cube molds with a small lemon slice and some vinegar (no water), then freeze overnight. 15. RUN SOAPY WATER THROUGH BLENDERS AND FOOD PROCESSORS. If you’re (understandably) hesitant about reaching in to clean the blades, just run some soapy water through the blender. The power that purees can be the power that cleans.